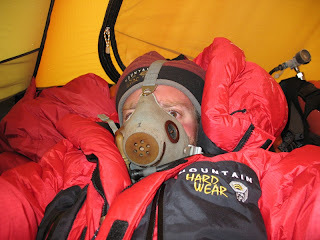 I mentioned in a posting last week that my cousin, Brian Smith, was in the process of climbing Mt. Everest. He's been climbing mountains since high school (when he made his first winter ascent of Mt. Rainier), and climbing Everest has been his dream for as long as I can remember. He's paid out quite a lot of money to be on this expedition, and has had more than his fair share of suffering. This picture here, for instance, was taken while he was suffering from HAPE up at Camp II, about three weeks ago. He managed to descend back down to base camp, but after some time there, still not recovering, he walked the 35 miles back to Namche Bazaar, figuring that his attempt on the summit had come to an end. But in the thick air (at 10,000 feet) he managed to recover enough that the doctors gave him a clean bill of health, and he walked back to base camp, and began his acclimitization all over again. The latest news I've heard (from the Mountain Madness website) is that he and his guide have begun their summit push, leaving Camp IV at about 8:30 pm in the evening. Every member of his family is very excited for him, and I'll post details as soon as I have them. My Dad has posted more pictures of his climb -- before this most recent push -- here. "Mr. Jones, of Worthing, Not Dead Yet"